50 Days after Easter is the feastday Pentecost (Whitsunday), also called Holy Trinity. The Holy Ghost feastday is on the following day. Name day of everyone called Trayko, Trayan, Trayana. It is a church feast that commemorates the Descent of the Holy Ghost upon the Apostles, fifty days after the Resurrection of Christ - on the ancient Jewish festival called the "feast of weeks" or Pentecost. It also has the name of Whitsunday, because of the white garments which were worn by those who were baptised during the vigil; while the name Pentecost ("Pfingsten" in German), comes from the Greek word for "the fiftieth" (i.e. fiftieth day after Easter). The Feastday of Pentecost occurs 50 days after the celebration of the Glorious Resurrection. It commemorates the descent of the Holy Spirit on the heads of the Apostles, infusing them with the mandate to go forth into the world and preach the Gospel. It is celebrated as a major feastday in all of the ancient Apostolic Churches of East and West, and is considered the birthday of the Church. In the Eastern Orthodox Church, however, the feast does not stand alone. 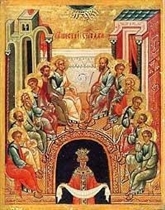 On Pentecost the Eastern Orthodox Church also celebrates the Feastday of the Holy Trinity and on the Saturday preceding it is "Zadoushnitsa", i.e. one of the five Saturdays throughout the year specially dedicated to the remembrance of the dead. How and why these three feasts came together at the same time is not known. These three feasts are flexiblei. e. their date is determined by the date of Easter (Resurrection Sunday) which varies from year to year. Fortuitously, rather than by design, the three feasts occur more or less in late spring or early summer, a time when agricultural peoples, are most concerned about preparing the fields and sowing the crops. The ancient Slavic cults always involved Mother Earth, the forests, the trees, the grass, the flowers and the waters and the spirits which inhabited them. One cult, believed to have derived from ancient Greek and Roman sources, called ANTHESTERIA in Greek, and ROSALIA in Latin, is called RUSALIYA in the Slavic languages. The spirits associated with this cult are called RUSALKI, which in Christian times were considered the souls of children and others who died unbaptized, or who drowned or who committed suicide or were executed. Such spirits dwelt in the forests or the waters and could be either benevolent or harmful to people, depending on mood.